Egg production at Great Hookley Farm began almost fifty years ago as a family business involving David and Mary Sheppard with David's parents Ted and Anne Sheppard. Today the business is still run by family members Andrew, Steven and Trevor, and has been considerably expanded by this younger generation of the Sheppard family together with a further ten members of staff to help create and maintain a small but caring business. In 1960 the farm started producing eggs from 2,500 chickens. The eggs were sold locally and delivered daily to houses within a five mile radius of the farm. As demand for eggs increased more chickens were added to the farm and were reared from day old chicks in buildings specially built to keep them at the correct temperature in their early days. Within ten years the total number of chickens at Great Hookley Farm had increased to 25,000. Sales then included shops and restaurants in the Guildford and Godalming area. Many local people have been involved with the production of eggs at the farm, either as part time egg collectors or working full time delivering the eggs, grading and packing them in the farm's distinctive boxes. During the 80's the catering outlets supplied by Great Hookley Farm demanded more products from one supplier and a comprehensive range of dairy products, including milk, cream, butter, cheese, yoghurts, fruit juices and many other products, totalling over 150, were sold to exisitng and new customers. In 1987 the farm entered the national Golden Egg Award competition, which attracts more than 250 entries from all over England. There were 17 finalists and the judging took place at Stoneleigh in Warwickshire. The farm was judged to have produced the best quality eggs in England and won the prestigious Golden Egg Award for 1987. Great Hookley Farm are proud to conform to the latest welfare standards of their intensively produced eggs, as introduced by the EC in early 2012. 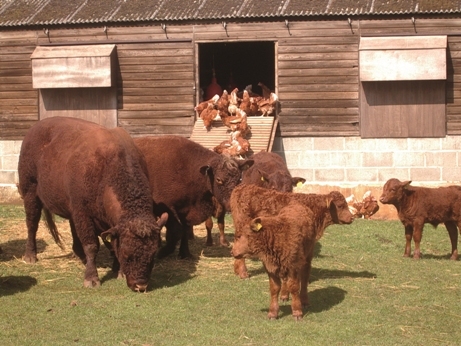 The farm also runs a herd of pedigree North Devon cattle, a North Devon bull runs with the females and calves are produced each year to be sold mostly to farmers in the West Country with herds of North Devon cattle. The present day farm has changed considerably since the early days and eggs are produced intensively as well as free range. Many more products have been added and if not stocked can usually be obtained for delivery the following day.